This card has two recycled things on it. First -- the paper that basket of apples is printed on is out of "paint boxes" from the hardware store. Second --- the tag is made out of a piece from a cardboard box. I saw the "Try a New Technique" challenge over at Splitcoast (gallery here) this week was to use corrugated cardboard on your project and something clicked.....I remembered a little stash of cardboard I'd saved back for projects like this. 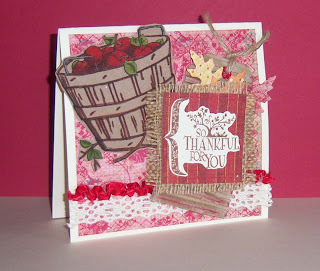 So....I dug it out and set to creating......the above card was my finished product. Entering this over at Speedy The Cat's Friends Challenge --- To make a friendship card. Nice Fall Friendship card! Thanks for playing with Speedy's Friends! I like the textures you chose...for the Speedy the Cat's Friends challenge!